Birds On A Wire is quirky with high variance video slot that was added to Thunder kicks huge slots portfolio back in 2014. Expect to find a theoretical return to player RTP of 96% as well as unique features like the Dropping symbols which reward up to 5 times your stake, not mentioning the 34 free spins with a 20 times multiplier available in the bonus round. Are you ready to try out Inwinity Spins? It is quite common to see birds lining on the telephone and electric wires in the cities, towns and countrysides. 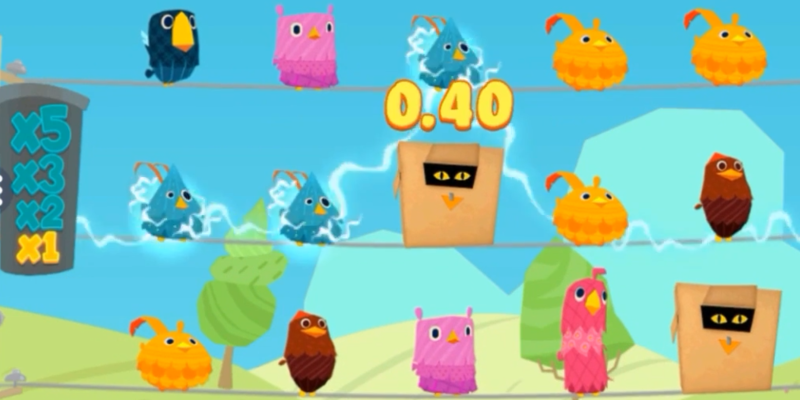 Inspired by the same idea, Thunderkick has gone a step further by creating an exciting slot branded 'Birds On A Wire'. It is a classic slot with an appealing, innovative design packed with great features. The designer has done great work with the graphics as well as the general idea of the game which makes it fun to play and highly rewarding. Form winning combinations by zapping off the goofy looking birds from the electric wires and replacing them with new ones. 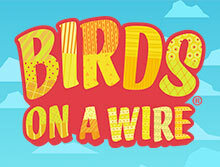 You can play Birds On A Wire video slot on any mobile devices powered by Android and iOS from anywhere in the world. If you have to watch Pixar mini-movie or played Angry Birds before, you will find Thunderkick's Birds On A Wire slot quite interesting. The developer has used eight birds with different colours, sizes and shapes. All the birds on the electric poles look dopey to add humour and fun to the gameplay. Enjoy watching them as they get electrocuted by the high voltage telephone poles. The birds will be electrocuted, squawk, burn to skeletons and their feathers disappear as the Dropping symbols substitute them. Thunderkick has used a perfect jazzy soundtrack that plays in the background to accompany you on your adventure. You will also hear the sound of feathers swooping in from time to time as you play. The interface of Birds On A Wire slot is simple enough to be used by a rookie as well as regular slots players. The objective of the game is to land winning combinations by zapping off the birds on the poles and replacing them with the Dropping symbols. Besides the symbols, this slot has several features to increase your chances of winning huge prizes. The format used in Birds On A Wire slot is not new to most slot gamers as it features 17 pay lines, five reels and three rows. As the slot loads, you will notice that there are no traditional reels but electric poles and wires. The gameplay is smooth, and the birds will move at a moderate speed, which makes it easy for players to follow up the gameplay. The Avian symbols, as well as graphics, are excellently done, to ensure that the slot is playable across primary devices like laptops and mobile devices. The minimum bet in Birds On A Wire slot is $10 while the maximum is bet amount is $100 per spin. You can select between a minimum and maximum stakes while the 17 win lines make it for you to multiply your winnings. Birds On A Wire slot also features an Autoplay button which allows you to set the number of spins ( between 5 and 5000) you wish to play. The good thing is that this game mode can activate free spins. The bottom bar displays your Balance, Total Win and the Bet Value for the active spin while the 'Spin' button is placed in the lower right side of your screen. The main game symbols in Birds On A Wire slot are the feathered birds, just as you would expect. The birds are listed starting from the low value to the highest value, and they are identified by different colours Blue, Red, Yellow, Turquoise, Green, Pink and Brown. The hen is the most top rewarding symbol as it can pay up to 12 times your bet if you land five of them in a row. The Pink Owl is the second highest paying symbol as it can reward up to 8 times your wins while the Parrot is the third in line and rewards up to 6 times your wins. All other symbols in an assortment of colours in the game offer different payouts as per the pay table. The substantial fat represents the wild symbol, and it substitutes for all symbols in the game except the bonus symbols. Land five of this huge feathered friend and you will win up to 200 coins! Five Brown birds will reward you 12 times your total bet amount, and four will pay three times while three will reward you one. The Pink bird rewards eight times for five, 1.50 times for four ads 0.70 times for five. Get three or more of the bonus symbols to win the bonus game starting at ten free spins. Anny bonus symbols grant two additional free spins, up to a maximum of 34 free spins. These are the most exciting symbols in Birds On A Wire slot game. Most (if not all) Thunderkick video slots offer players with a multiplier of up to 5 times the bet. For example, in the free spins feature you can land up to 34 free spins while the dropping symbol's multiplier can go up to 20 times! For each win on a drop, the multiplier increases one level high. Multiplier levels in the main game arex1, x2, x3, x5 while the multiplier levels in the bonus game are x4, x8, x12 and x20. Inwinity Spin is activated when all free spins in a bonus game have been played. With Inwinity Spin active, the game will continue to spin until a win. One good thing about Thunderkick's video slots games is that they are playable both on tablets and smartphones. Birds On A Wire slot is not an exception as it is created with HTML5 technology. This new technology enables slot games to maintain high end graphics, visual animations and a seamless, fast paced gameplay on small screen devices that are powered by Android and iOS. Birds On A Wire slot is available in instant play mode, meaning, you don't need to download a software to play. Just login in at any reputable mobile casino like bCasino and enjoy playing on the go from any place in the world. The standard mobile browsers you can use include Chrome, Safari, Firefox and Opera. Thunderkick software developing company was founded in 2012 with the idea of creating online casino games that will enhance the general player experience. Today, they are an independent online slot game supplier and Remote Gaming Server (RGS) with offices based in Stockholm and Malta. As witnessed in the past releases, the developer is committed to crafting unique and top-notch products. They not only pride in having numerous ideas but also having the knowledge to execute them. Malta and the UK Gambling Commission fully license Thunderkick and certified to offer their products and services in several jurisdictions. The UK is one of the leading online gambling markets in the world. As such, there are tons of online casinos offering players with an extensive collection of games as well as bonus offers. However, it is essential to understand that not all online casinos are legit. Which is why you need to consider several factors when choosing a reputable online casino site. bCasino is a new yet popular online casino site which is owned and operated by the famous GS Technology Ltd company. We are licensed by the UK Gambling Commission to offer our services within its borders and beyond. Our game lobby is powered by several renown game developers like Thunderkick, NetEnt, Playson, Fugaso, Pragmatic Play and Evolution Gaming and tested by a recognisable independent testing lab. We use the latest 128-bit Secure Socket Layer encryption technology to secure all our customer's online transactions and sensitive information. In addition, we guarantee a generous welcome bonus of up to $1200 plus free spins to all our new members upon making the first deposit. You will enjoy friendly customer support service via email, live chat and telephone from our committed agents 24/7.